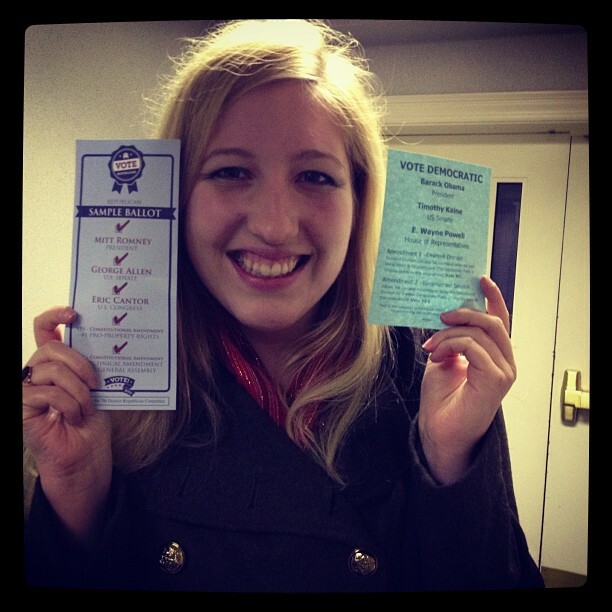 This past Tuesday was my first time voting at the polls. I’ve been eligible to vote in the last three elections. For the first, I voted by absentee ballot because I was away at university and wanted to vote as a Virginian, not a Missourian. For the second, I didn’t vote. Now, the cool thing would be to say that I chose not to vote, either to make some profound political statement or because voting is just too mainstream. The truth is that I was oversees and was simply unaware that there was a deadline to register for absentee voting. But for this election year, I was in America and, dang it, I wanted that shiny sticker! So when Tuesday arrived, and after I had a brief emotional breakdown (“I don’t know who to vote for! Ahhh!”), and a moment of prayer with my family, I ended up at the back of line at a Baptist church waiting to push a button. Now, I’m a perfectionist, and I hate doing something when I don’t really know what I’m doing, so when the woman at the door asked if anyone needed a demonstration on how to use the machine, I jumped at the chance. This incredibly sweet and kind old man showed my mother, my sister, and myself how to use the machine. 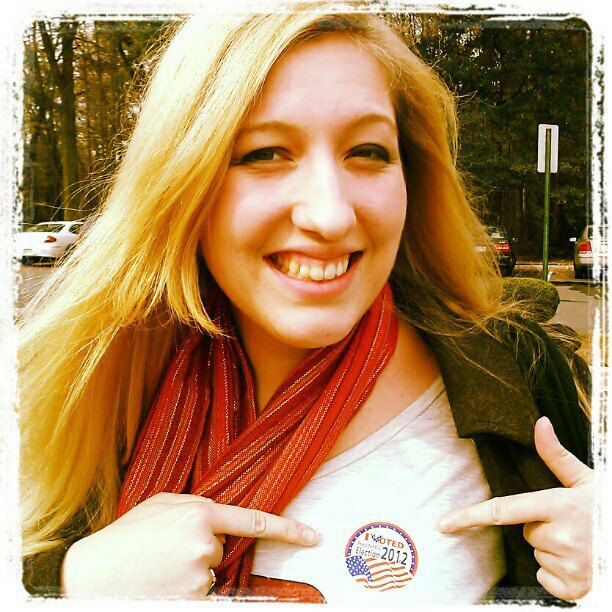 (My mother hasn’t voted in America for a while, and my sister was a first-time voter.) Pretty simple stuff, although during the demonstration the man asked me to pick a president from the sample ballot, I made a mistake. I meant to pick Abraham Lincoln but somehow picked Thomas Jefferson. Darn touchscreen! The man was kind enough to show me how to fix my vote if that happens, for which I am thankful. I really don’t want TJ in office again. Then it was back in line to cast my vote. Surprisingly, once I got in front of the touch screen, I knew for whom I was going to vote. It was an honor to take part in my nation’s election. Plus, it was a lot of fun hitting that big VOTE button at the end. That might be too much force, Doctor. While we waited for my sister outside, my mom took this picture of me. I was very proud of myself and of my sticker. My sister soon joined us only to realize she had forgotten to get her sticker! She ran back but the door wouldn’t open, so she waited until another voter exited and then begged the man on the inside for her sticker. He gave her two. 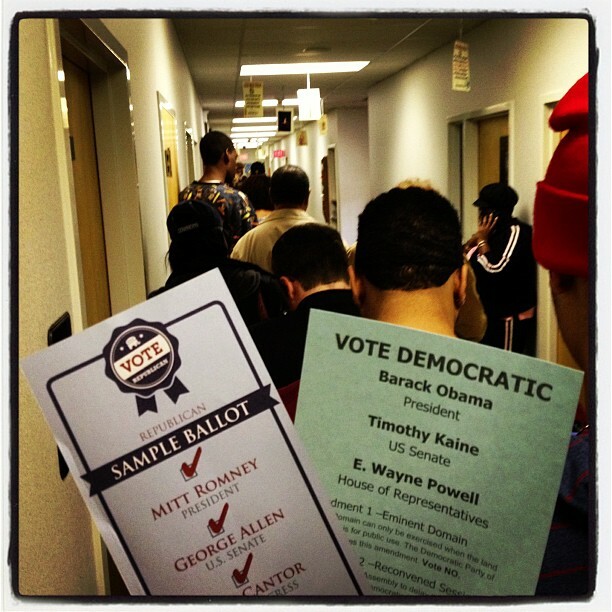 This entry was posted in America and tagged Democrat, Election 2012, Mitt Romney, President Obama, Republican, voting. Bookmark the permalink.